Joshua L. Cowen, founder of the Lionel Corporation, built the first toy train. The train was a wooden flatcar with a small electric motor that ran on a track of brass strips linked by wooden ties. In 1907, Cowen made history by selling model trains built after the genuine Baltimore and Ohio trains. 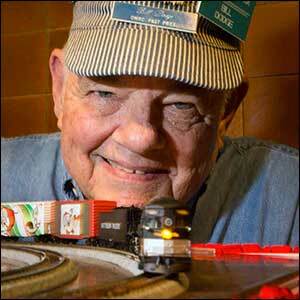 With every passing year, he created more gadgets for the train set, adding to the infatuation of model train lovers. The Lionel Corporation owned the market for these train sets and it became an obsession to enthusiasts. With the war affecting the economy in 1941, Cowen stopped making model trains and signed a contract with the government to build gun mounts and various other war materials. It wasn’t until 1945, when the atom bomb hit Hiroshima, that his contracts were canceled and he began making model trains again. By Christmas, the Lionel Corporation hit the ground running with cars that actually mimicked real trains – smoking smokestacks, whistling whistles, freight cars that had scale cattle — you name it. It seemed as if these model trains not only captured the hearts of youngsters around the country, but also their fathers. Fathers and sons now had this captivating pastime in common. The passion began to fade around 1963 with the introduction of slot cars to the public. Although model trains are not as popular as they were in the 1940’s, Lionel Train Sets have become a collectors items and remained a fixture in the hearts of fathers and sons everywhere.